Martin Butlin was formerly Keeper of the Historic British Collection at the Tate Gallery, London. Since retirement, he has continued to work on Blake, J.M.W. Turner, and other British artists. Robert N. Essick studied printmaking at Pasadena City College in the mid-1970s. Since then, he has continued to experiment with Blake’s etching processes and to print from facsimile plates. 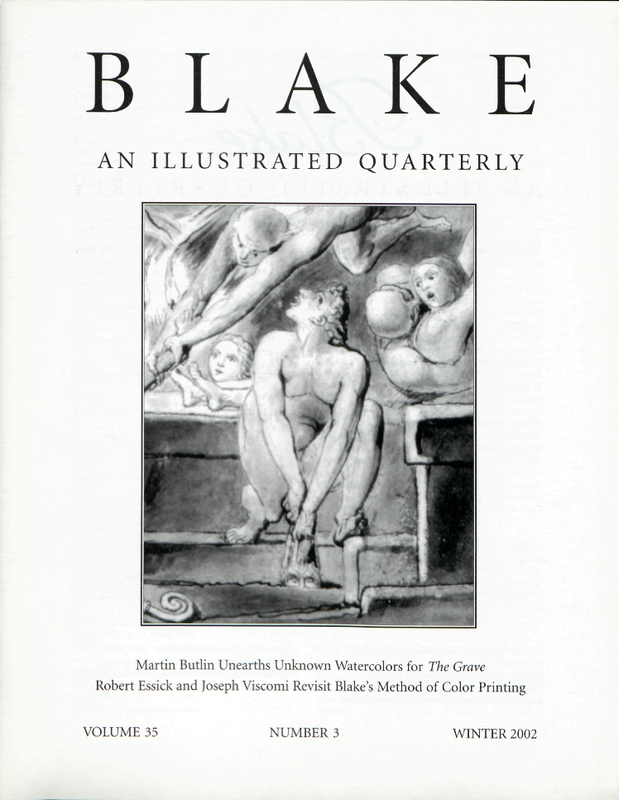 Selections of his plates and prints have been shown at several exhibitions, including “William Blake and the Art of His Time,” held at the University of California at Santa Barbara in 1976, “The Mechanised Image,” organized by the Arts Council of Great Britain in 1978, and “William Blake’s Illuminated Prints,” held at the Huntington Library in 1994. Joseph Viscomi studied printmaking at Columbia University, and identified and catalogued prints for the Departments of Prints and Drawings at the Museum of the City of New York and Herbert F. Johnson Museum. He was the technical consultant on the Manchester Etching Workshop 1983 facsimile of Songs, for which he wrote The Art of William Blake’s Illuminated Prints, has curated numerous print exhibitions, including “Prints by Blake and His Followers” held at the Johnson Museum, and edited Process & Problems in Contemporary Printmaking, the exhibition catalogue of prints by John Brody. He is the author of “Illuminated Printing” in the forthcoming Cambridge Companion to Blake. Cover: Detail of “The Gambols of Ghosts according with their affections previous to the final Judgment.” Pen, ink and watercolor, 27.4 × 21.7 cm., 1805. Courtesy of Dominic Winter Book Auctions.